Cockroaches will eat anything and will happily chow down on any foody temptation that comes their way. Like humans, they enjoy a mixed diet of protein and carbohydrates, but unlike us, they can last one or two weeks without water, providing the moisture content of the food they’re having is high. As such, the best way to rid your premises of cockroaches is to eliminate access to food supply. While they can live for a few weeks without water, they ideally don’t want to, so make sure you remove any temptations, such as standing water in sinks, buckets or troughs. Keep food sources away from cockroaches by cleaning away any waste effectively and ensuring any temptations are safely packed away in airtight containers within a store cupboard where possible. Bins are, of course, a cockroach’s dream, so be sure to keep refuse areas clean and tidy; it only takes the residue from a single tin to tempt the hungry cockroach. Although you can take the necessary procedures to limit the food accessible to cockroaches, this will not remove them 100%. Cockroaches are known to consume other forms of food that may sound strange to you and me. Studies show that cockroaches will eat paper, glue and even turn to cannibalism when traditional forms of food are not available. Cockroaches release a pheromone in their droppings, which offers a welcome light to fellow cockroaches to come and join the party. Any areas of clutter within your workplace, especially if damp, are the perfect place for cockroaches to make their new home and invite their friends to join them. 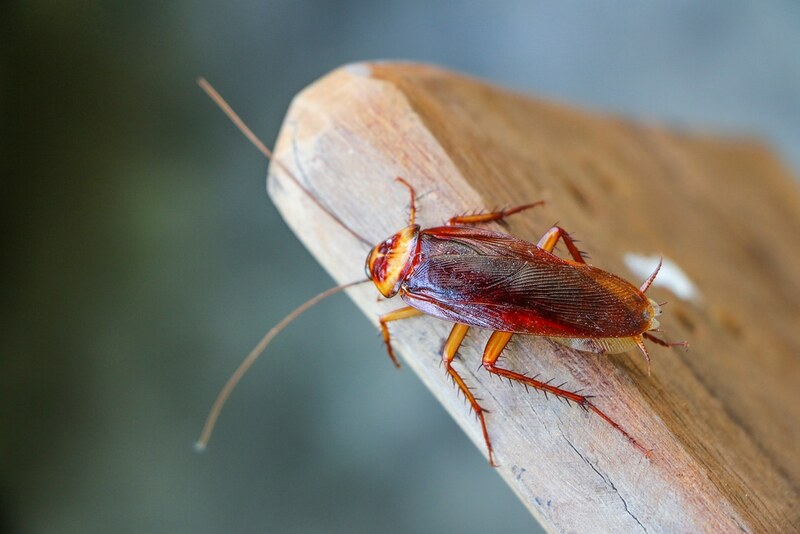 Think about damp areas you might have on your premises, such as pipes and drains or piles of leaves; these are the perfect cockroach breeding grounds. Ensuring regular maintenance checks in these areas will expose any signs of concern, as well as highlighting any remedy works which may be taken in order to prevent cockroaches making their mark. Consider any access points from which cockroaches might enter your property, through cracks and gaps in walls, skirting boards, sockets or through kitchen and bathroom pipework and fill in where possible. If you need to seek professional advice as to a potential cockroach issue, please contact us.